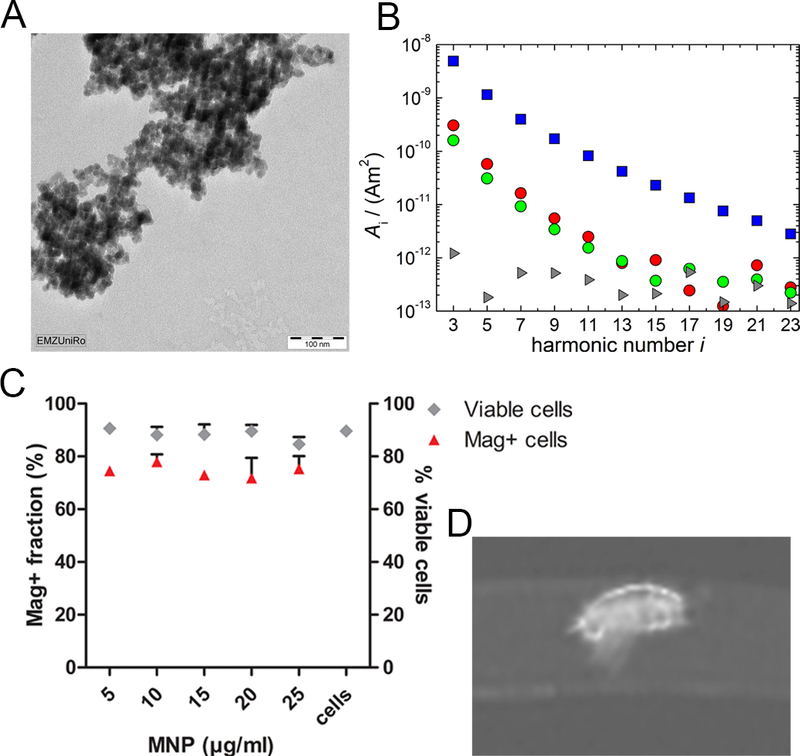 This manuscript describes the efficient, non-viral delivery of miR to endothelial cells by a PEI/MNP vector and their magnetization. Thus, in addition to genetic modification, this approach allows for magnetic cell guidance and MRI detectability. The technique can be used to improve the characteristics of therapeutic cell products. Voronina, N., Lemcke, H., Wiekhorst, F., Kühn, J. P., Frank, M., Steinhoff, G., David, R. Preparation and In Vitro Characterization of Magnetized miR-modified Endothelial Cells. J. Vis. Exp. (123), e55567, doi:10.3791/55567 (2017). To date, the available surgical and pharmacological treatments for cardiovascular diseases (CVD) are limited and often palliative. At the same time, gene and cell therapies are highly promising alternative approaches for CVD treatment. However, the broad clinical application of gene therapy is greatly limited by the lack of suitable gene delivery systems. The development of appropriate gene delivery vectors can provide a solution to current challenges in cell therapy. In particular, existing drawbacks, such as limited efficiency and low cell retention in the injured organ, could be overcome by appropriate cell engineering (i.e., genetic) prior to transplantation. The presented protocol describes the efficient and safe transient modification of endothelial cells using a polyethyleneimine superparamagnetic magnetic nanoparticle (PEI/MNP)-based delivery vector. Also, the algorithm and methods for cell characterization are defined. The successful intracellular delivery of microRNA (miR) into human umbilical vein endothelial cells (HUVECs) has been achieved without affecting cell viability, functionality, or intercellular communication. Moreover, this approach was proven to cause a strong functional effect in introduced exogenous miR. Importantly, the application of this MNP-based vector ensures cell magnetization, with accompanying possibilities of magnetic targeting and non-invasive MRI tracing. This may provide a basis for magnetically guided, genetically engineered cell therapeutics that can be monitored non-invasively with MRI. Gene and cell therapy are powerful tools that have the potential to solve current challenges in CVD treatment. Despite the fact that both of these approaches are currently being tested in clinical trials, they are not yet ready for wide clinical application1. Notably, a common approach to tackle the challenges of gene and cell therapy is to develop multifunctional gene delivery vectors suitable for clinical application. The lack of safe and efficient gene delivery systems is the main concern of gene therapy. At the same time, the genetic engineering of cellular products prior to transplantation could overcome the serious challenges of cell therapy, such as low efficiency (e.g., in the cardiac field, only ~ 5% of functional improvement is achieved post-stem cell transplantation1) and poor retention/engraftment at the site of injury (i.e.,cell retention drops below 5 - 10% within minutes to hours post-application, regardless of the administration route2,3,4). To date, viral vectors greatly exceed non-viral systems in terms of efficiency, which has resulted in their wider application in clinical trials (~ 67%)5. However, viral vehicles carry serious risks, such as immunogenicity (and the subsequent inflammatory response, with severe complications), oncogenicity, and limitations in the size of the carried genetic material6. Due to these safety concerns and the high costs of viral vector production, the use of non-viral systems is preferable in certain cases7,8. It is particularly suitable for disorders that require transient genetic correction, such as the expression of growth factors controlling angiogenesis (e.g., for CVD treatment) or the delivery of vaccines. In our group, a delivery system was designed by combining branched 25-kDa polyethyleneimine (PEI) and superparamagnetic iron oxide nanoparticles (MNP) bound together by biotin-streptavidin interaction9. This vector is a potential tool for the genetic engineering of cells, allowing for their simultaneous magnetization prior to transplantation. The latter provides a basis for magnetic guidance/retention, which is particularly promising nowadays, as advanced magnetic targeting techniques are being successfully developed10. Moreover, the resulting magnetically responsive cells have the potential to be non-invasively monitored by magnetic resonance imaging (MRI) or magnetic particle imaging11,12. In the case of the PEI/MNP vector, polyamine ensures nucleic acid condensation and thus protection from degrading factors, vector internalization in cells, and endosomal escape5. The MNPs complement the properties of PEI, not only in terms of magnetic guidance, but also by reducing the known PEI toxicity7,13,14. Previously, PEI/MNP vector properties were adjusted in terms of delivery efficiency (i.e., pDNA and miRNA) and safety by using fibroblasts and human mesenchymal stem cells15,16. In this manuscript, a detailed protocol on the application of PEI/MNPs for the generation of miRNA-modified cells is described17. For this purpose, HUVECs are used and represent an established model for in vitro angiogenesis. They are challenging to transfect and are susceptible to toxic influence18,19,20. In addition, we provide an algorithm to evaluate such cells in vitro, including their targeting, intercellular communication, and MRI detection. Human umbilical cords for cell isolation were obtained postpartum from informed, healthy women who gave their written consent to the use of this material for research according to the Declaration of Helsinki. The ethical committee of the University of Rostock has approved the presented study (reg. No. A 2011 06, prolonged 23 September, 2013). Dissolve branched PEI in ultrapure water under magnetic stirring at 300 - 400 rpm for 24 h at room temperature (RT) and protected from light to obtain a 0.18-mM solution. Store the solution at 4 °C. Measure the concentration of primary amino groups in the obtained solution21,22. Use 2% ninhydrin reagent solution as the amine detection reagent23 by mixing 100 µL of prediluted sample (1:200 with ultrapure water) and 75 µL of ninhydrin reagent. Incubate for 30 min at 80 °C. Cool it down and add 100 µL of 50% ethanol for stabilization. Measure the absorbance at 550 nm on the absorption spectrophotometer. Create a standard curve using glycine. Prepare 0.1 M amino-N stock solution (0.75 g of glycine in 100 mL of deionized water) and its dilutions, 1:1, 1:5, 1:10, 1:20, 1:40, 1:80, 1:100, 1:200, and 1:400, 1:600. Measure these solutions as in step 1.1.2.1 and create a plot with the concentration and absorbance on the axes. Based on the obtained plot and the measured absorbance of the PEI solution, define the concentration of the α-amino groups in PEI. NOTE: Caution. Ninhydrin reagent solution must exclusively be used under the hood and should be stored under a nitrogen atmosphere. It is not usable when the color of the solution changes due to oxidation. Dissolve 100 mg of biotin linker in ultrapure water immediately before use to obtain a 0.01-mM solution. Calculate the required amount of biotin to add to PEI by multiplying the concentration of α-amino groups in PEI (measured in step 1.1.2) by 20 to obtain the necessary amount (in mol) of biotinylating reagent. Add the biotin solution to the PEI solution at pH 8-9 and incubate for 16 h under magnetic stirring at RT. Remove the unreacted biotin by size-exclusion chromatography23. Use commercially available columns containing a gel filtration medium appropriate for the purification of the 25-kDA PEI and follow the manufacturer's instructions. Take aliquots after purification to measure the amine concentration using an amine detection reagent (step 1.1.2) and to determine the biotin conjugation efficiency (step 1.2.2). Store the obtained biotinylated PEI at 4 °C. Determine the concentration of α-amino groups in PEI after the biotinylation, as described in step 1.1.2. Determine the degree of PEI biotinylation to verify the conjugation procedure. For quantification, use a commercially available kit, which is based on the application of HABA dye (4'-hydroxyazobenzene-2-carboxylic acid), to ensure the correct colorimetric determination of the biotinylation levels24,25. Follow the instructions provided by the manufacturer. Filtration of MNPs and their characterization. Filter commercially available streptavidin-coated MNP through a 0.45-µm syringe-driven filter16 in order to exclude bigger toxic aggregates. Measure the final iron concentration using a standard photometric assay26. Examine the quality of the filtered MNPs by recording the magnetization curve and by TEM imaging in accordance with standard protocols27,28. Dilute the MNP suspension with distilled water and place 3 µL of the obtained suspension on a 300-mesh Formvar carbon-coated copper grid for TEM analysis. Subsequently, place this grid on a glass slide on a heating plate and let it dry. Analyze the specimen with a transmission electron microscope at 120 kV and verify the elemental content using an X-ray detector27. 3-color labelling of transfection complexes for super-resolution microscopy. Label 0.5% of the measured primary amino groups in PEI with NHS-Ester Atto 488 dye following the manufacturer's instructions. Remove the excess unbound dye by size-exclusion chromatography, as described above (step 1.1.4). Measure the resulting concentration of amino groups using a ninhydrin assay (step 1.1.2). Label commercially available scrambled miR (scr-miR) with Cyanine5 dye using a suitable labelling kit15 (indicated in the Materials List). Measure the resulting fluorophore-miR concentration spectrophotometrically. Freshly label the MNP each time with biotin-conjugated dye (e.g., atto 565-biotin) at a 1:1,000 w/w ratio. Directly apply the dye after adding the MNP to the miR/PEI during the formation of the transfection complexes, per the details in Delyangina et al.16. Isolate cells from the umbilical cords directly after obtaining the cords using collagenase digestion from the interior of the cord vein; follow a previously developed protocol29. Incubate each cord with ~ 60 units/mL of collagenase type IV solution in buffer - loaded into the umbilical vein - at 37 °C for 13 min. For all experiments, pool the HUVECs from a minimum of 5 patients. NOTE: Cultivation should not exceed 4-5 passages. Do not use cells contaminated with mycoplasma, as this causes a decrease in the transfection efficiency. Mycoplasma contamination should be tested for before starting the protocol by using a PCR kit for the highly sensitive detection of mycoplasmas. Centrifuge 1 mL of cell culture supernatant for 10 min (13,000 x g). Suspend the pellet in 17 µL of dH2O and boil (93 °C) for 3 min. Use 2 µL of the suspension to amplify the DNA region that codes for highly conserved ribosomal RNAs (16S-rRNA) of various mycoplasma species. Perform the PCR using 10 pmol of each primer (forward primer: 5′-CTGACGACAACCATGCACCATCTGTC-3′; reverse primer: 5′-GAAAGCGTGGGGAGCAAACAGGATTAG-3′) in combination with a commercial PCR kit under the following conditions: 94 °C for 3 min; 45 cycles of 94 °C for 30 s, 50 °C for 30 s, and 72 °C for 30 s; and a final extension at 72 °C for 10 min. Analyze the PCR product (292 bp) using agarose gel electrophoresis. Either store the obtained cells long term in liquid nitrogen or culture them in the endothelial growth medium supplemented with 100 U/mL penicillin and 100 µg/mL streptomycin at 37 °C in a humidiﬁed atmosphere containing 5% CO2. Characterize isolated HUVECs in terms of their functional capacity to build tubes in the basement membrane matrix (e.g., matrigel) and their expression of the endothelial marker CD31 (platelet endothelial cell adhesion molecule, PECAM-1) following standard protocols30,31. Trypsinize the stock HUVEC culture (see step 4.1.2.) and manually count the cells using a hemocytometer. Seed the HUVECs on plastic cell culture well plates of suitable size, with a starting cell density of approximately 13,000 cells/cm2 of growth surface, 48 h prior to transfection until 70-80% confluence is reached. Prepare fresh miR/PEI/MNP complexes every time. NOTE: First, miR/PEI complexes should be obtained (steps 3.2.1 - 3.2.3); subsequently, MNPs should be added to the miR/PEI solution (step 3.2.4) in order to get the final miR/PEI/MNP formulation used for transfection (step 3.3). Calculate the amount of appropriate commercially available miR (scrambled, tagged or functional, see step 4) using the concentration of the stock provided by the manufacturer. Use 2.5 pmol of miR/cm2 of cell growth surface. Dilute the miR in 5% glucose solution to obtain a final concentration of 0.125 pmol of miR/µL. Based on the miR amount from step 3.2.1 and the optimal NP ratio of 2532, calculate the required amount of PEI using its measured concentration (step 1.1.2). Dilute the PEI (per the calculated required volume) in an equal volume of 5% glucose solution. Add the obtained pre-diluted PEI to the miR solution (from step 3.2.1) and vortex the obtained mixture for 30 s.
Incubate the obtained miR/PEI mixture for 30 min at RT. Sonicate the MNPs at 35 kHz for least 20 min in the sonicating water bath (see the Materials List) at RT, add the appropriate amount of MNP solution to the miR/PEI (5 - 25 µg of iron/mL of prepared miR/PEI/MNP mixture16), vortex for 30 s, and incubate for 30 min at RT until ready. Add the prepared miR/PEI/MNP mixture dropwise directly to the culture medium on the cells. Use the resulting mixture of cell culture medium with miR/PEI/MNP diluted in glucose as the transfection solution. Replace this mixture with fresh culture medium 6 h post-transfection. Transfect the HUVECs seeded in a 24-well culture plate (steps 3.1 and 3.2); use Cy3-miR as the test probes and scrambled miR (scr-miR) as the control gating probes for the flow cytometry. Incubate at 37 °C in a humidiﬁed atmosphere containing 5% CO2 for 24 h.
Collect the supernatant and transfected cells by trypsinization using 1x Trypsin-EDTA diluted in PBS added to the cells for 4 min at 37 °C. Centrifuge at 300 x g for 10 min and use for the analysis. Examine cell viability and miR uptake efficiency 24 h after transfection using flow cytometry by applying a commercially available stain to distinguish between living/dead cells; use standard protocols15. Apply untransfected cells as a positive control for viability. Examine the safety of the miR/PEI/MNP complexes for cells in functional assays. Evaluate the proliferation activity of transfected cells. Transfect HUVECs seeded in a 12-well culture plate (steps 3.1 and 3.2) with functional antisense miR (e.g., anti-miR92a for HUVECs31) and incubate at 37 °C in a humidiﬁed atmosphere containing 5% CO2 for 24 h.
Use a commercially available kit to define the number of proliferating cells by staining with EdU (5-ethynyl-2´-deoxyuridine) and scanning with laser-based confocal microscopy. Use the following microscopy settings: 40X objective with oil immersion; 633-nm excitation laser (for a 647-nm dye); 5 random fields to be recorded in each sample. Calculate the rate of proliferating cells by dividing the number of EdU-stained nuclei by the total nuclei number (Hoechst-stained). Evaluate the ability of transfected cells to form tube-like structures, as previously described17,31. Transfect the HUVECs seeded in a 24-well culture plate (steps 3.1 and 3.2) with scr-miR and incubate for 48 h at 37 °C in a humidiﬁed atmosphere containing 5% CO2. Collect the transfected cells (as in step 4.1.1). Seed 3.5 x 104 of modified HUVECs in 24-well plates coated with 140 µL of basement membrane matrix. Incubate for 18 h at 37 °C in a humidiﬁed atmosphere containing 5% CO2. Record images of 10 random fields in each well using laser scanning confocal microscopy (differential interference contrast) and analyze using ImageJ software with the "Angiogenesis Analyzer" plugin. Include such parameters as the total length of branches, the number of branches, and the number of junctions in the evaluation. Compare this to the untreated control. Examine the possible toxic influence of transfection complexes on gap junction (GJ)-mediated intercellular communication (GJIC) by testing 3D fluorescence recovery after photobleaching (FRAP)33 in 3D. Seed the cells on gelatin-coated glass slides with a thin bottom suitable for live-cell imaging (oil immersion). Transfect the cells as described above in step 3.2 with non-labeled, non-functional miR (scr-miR) and incubate for 24 h.
Prepare the cells for imaging by loading them with calcein directly before microscopy. In particular, replace the culture medium with fresh medium containing 5 µM calcein, incubate for 20 min, wash with PBS, and add fresh culture medium. Pre-warm the incubator of the microscope to 37 °C and adjust the CO2 concentration to 5%. NOTE: All the reagents should be warm to avoid cell contraction before measurement. Use a 561-nm excitation laser for cell visualization and the FRAP experiment. First, manually select cells for measurement as regions of interest (ROI); test cells should have at least 3 neighboring cells. Define a reference cell with bright, stable fluorescence that will not be bleached. Define the limits of a z-stack. Record the fluorescence from the top of the cells to the bottom to include 10 - 15 layers. Bleach the test cells using 100% laser power and record the subsequent fluorescence recovery (due to GJ-specific dye transfer from neighboring cells) during the following 15 min. Record the raw data in the z-stacks every 60 s. In total, perform the FRAP measurements with not less than 5 - 10 test cells per experiment. Compare the results to untransfected cells. Prepare the probes as described in step 4.1 and use them simultaneously to define miR uptake with flow cytometry. Confirm and describe the intracellular localization of transfection complexes by confocal and superresolution structured illumination microscopy (SIM). Seed the HUVECs on gelatin-coated glass coverslips placed in the wells of 24-well culture plates, as described before (step 3.1). Transfect the cells with 3-color labeled miR/PEI/MNP (step 1.4) and incubate for 24 h at 37 °C in a humidiﬁed atmosphere containing 5% CO2. Wash the coverslips first with 2% bovine serum albumin (BSA) in phosphate-buffered saline (PBS) and then with just PBS. Fix cells by incubating in 4% paraformaldehyde (PFA) at 37 °C for 15 min and stain nuclei with DAPI following standard protocols16. Wash 3 times on the shaker (15 min each) to remove excess dye. NOTE: PFA is carcinogenic and must be handled carefully. Place the prepared coverslips on microscope slides using suitable mounting medium, let them dry at least for 1 h, and use them for microscopy, as described below. Acquire images using a 63X oil immersion objective and the following SIM settings: 405-, 488-, 561-, and 633-nm laser lines for excitation; z-stack mode with a 32-bit depth at 5 angles, 5 phases, with averaging of 4; G2 grid with a 405 laser line, G3 with a 488, G4 with a 561, and G5 with a 633. Evaluate the functionality of the delivered miR by RT-qPCR in miR/PEI/MNP-HUVECs versus untreated. Transfect the HUVECs seeded in a 12-well culture plate steps (3.1 and 3.2) with functional antisense miR (e.g., anti-miR92a for HUVECs31) and incubate for 48 h at 37 °C in a humidiﬁed atmosphere containing 5% CO2. Evaluate the anti-miR92a delivery and processing with RT-qPCR using commercially available kits (see the materials); follow the manufacturer's instructions, as described elsewhere17,31. In parallel, examine the expression of the target gene (e.g., ITGA531). NOTE: AntagomiR delivery against endogenous miR is preferred over mimics since it ensures the measurement of the actual outcome of the miR and not merely its intracellular accumulation. Cell targeting in static conditions in vitro. Transfect the HUVECs in a 24-well plate (2.5 pmol/cm2 scr-miR, NP 25, and 15-25 µg/mL MNP), incubate for 24 h, wash, and collect as described above (step 4). Mix the cell pellet obtained from 1 well with 1 mL of fresh culture medium and place it in the wells of a 12-well plate. Fix a small magnet locally (on the side) at the bottom of the plate using tape. Incubate the cell suspension for 24 h and observe the cell attachment and growth in the area over the magnet and in the area without a magnet. For a qualitative evaluation, use a conventional inverted microscope. Cell targeting in simulated dynamic conditions in vitro. Transfect the HUVECs in a 24-well plate per steps 3.1 and 3.2 (2.5 pmol/cm2 Cy3-miR, NP 25, and 15 - 25 µg/mL MNP), incubate for 24 h, wash, and collect by trypsinization using 1x Trypsin-EDTA diluted in PBS added to the cells for 4 min at 37 °C. Centrifuge at 300 x g for 10 min. Mix the cell pellet obtained from 1 well with 1 mL of fresh culture medium and place it in the well of a 12-well plate. Fix a small magnet locally (on the side of a well) using tape. Place the culture plate on the shaker and incubate the cell suspension for 12 h at 150 rpm to simulate dynamic conditions34. Wash the cells and fix them using 4% PFA. Stain the nuclei with DAPI16. Record the cell attachment using laser scanning confocal microscopy with a 514-nm excitation laser, z-stack mode (5 - 12 slices) to obtain raw data, and maximum intensity projection image processing to create images for analysis. Quantitative analysis of magnetically responsive and non-responsive cells. Transfect the HUVECs in a 24-well plate (2.5 pmol/cm2 scr-miR, NP 25, and 15-25 µg/mL MNP), incubate for 24 h, wash, and collect as described before (step 6.2.1). Pre-warm PBS and cell sorting buffer (sterilized by filtration, see the Materials List) to 37 °C. Re-suspend the cell pellet obtained from each well with 500 µL of cell sorting buffer. Apply this cell suspension to a magnetic sorting columns fixed by the supplied magnet, wash the columns on the magnet 3 times with fresh cell sorting buffer, and collect the flow-through as the magnetically unresponsive fraction (mag-). Remove the columns from the magnet and immediately collect the magnetically responsive cell fraction (mag+) by pushing fresh cell sorting buffer through the column using a plunger. Centrifuge both mag- and mag+ at 300 x g for 10 min. Re-suspend the cell pellet in PBS, count the cells, and evaluate cell viability with a Trypan blue exclusion assay35. Use the obtained cell pellet either for long-term analysis (i.e., re-seed and evaluate after 24, 48, and 72 h in culture17) or directly for flow cytometry (step 4.1.). Define the iron loading of the transfected cells. NOTE: During the preparation, any contact of the cell probes with iron oxide materials and instruments must be avoided. Collect the transfected HUVECs and untransfected control (as in step 4.1.1). Wash the collected cells twice in 2% BSA in PBS36 by carefully mixing the cells with 1 mL of this washing buffer and then centrifuging at 300 x g for 10 min. Re-suspend the obtained cell pellet in 250 µL of PBS, add 100 µL of 4% PFA, and incubate for 20 min to fix cells. Wash 3 times with PBS, as described above. Re-suspend the resulting fixed cell pellet in 110 µL of PBS and transfer it to 100-µL PCR tubes. Take 10-µL aliquots for cell counting and use the remaining sample for magnetic particle spectroscopy (MPS). Perform the measurement on a commercially available MPS device. During the measurement, apply the following settings: magnetic field Bdrive = 25 mT and frequency f0 = 25 kHz. For iron quantification of the samples, normalize the third harmonic A3 of the MPS-spectrum to the corresponding A3,ref of an MNP reference sample with a known iron amount of 2.1 µg37. Use untreated cells as controls. Seed HUVECs in a 6-well plate and transfect (2.5 pmol/cm2 scr-miR, NP 25, and 15 - 25 µg/mL MNP) in duplicates or triplicates in accordance with the required amount of cells (for phantom preparation). Incubate the cells for 24 h and wash, collect, and fix them with 4% PFA, as described before (step 4). Count the obtained cells, prepare aliquots with appropriate cell numbers (e.g., 103, 104, 105, etc. ), and adjust their volume to 50 µL. Prepare several layers of 2% agarose in 50-mL tubes with different amounts of transfected cells embedded between the layers38. During preparation, sonicate and centrifuge the hot agarose38 to destroy air bubbles that cause artifacts. NOTE: Importantly, phantoms containing 5.5 x 105 HUVECs treated with non-magnetic miR/PEI complexes should be prepared in the same manner to serve as controls. Scan the obtained in vitro phantoms with a 7.1 T animal MRI system after placing the phantom centrally in the coil, parallel to the z-axis of the magnetic field. Apply the following sequence parameters for a gradient-echo sequence acquisition: TR = 66 ms; TE1/TE2/TE3/TE4/TE5/TE6 = 1.44/2.88/4.51/6.11/7.60/9.01 ms; flip angle = 3°; matrix = 128 × 128, interpolated to 256 x 256; field of view = 42 mm; 100%; averages = 1, echo train length = 1; slice thickness = 1.5 mm; and 16 slices. Assess the signal decay of all four echo times and calculate R2* maps (R2* = 1/T2*) using appropriate software, as described elsewhere39. The main purpose of the proposed protocol is to produce magnetically responsive miR-modified cells and to conduct their accurate characterization (Figure 1). As a result, efficiently transfected cells, responsive to magnetic selection and guidance and detectable with MRI, should be obtained. First, the identities of isolated HUVECs were confirmed by typical staining with the endothelial marker CD31 (PECAM) (Figure 2A) and by their ability to form tubes on the appropriate basement membrane matrix (Figure 2B). The obtained cells took up the miR introduced by PEI/MNP very efficiently; microscopy demonstrated that all cells were positive for a signal of tagged miR (Cy3) 24 h post-transfection (Figure 3A). Importantly, no cell death was recorded compared to untreated cells (Figure 3B), and normal appearance was maintained (Figure 3A). As observed with confocal laser scanning microscopy, the signal of Cy3-miR was primarily located inside the cells. Moreover, a more detailed investigation of the intracellular localization of all parts of the transfection vector and miR was carried out with higher resolution using 3-color labeled complexes. SIM, miR, PEI, and MNP signals were all detected in the cytoplasm in the perinuclear region (Figure 3C). Furthermore, a detailed investigation of transfection vector safety has proven that miR/PEI/MNP-HUVECs are capable of forming tubes on the appropriate basement membrane matrix and that the resulting network is comparable to that of untreated cells used as a positive control (Figure 4A). Moreover, transfected cells maintained GJIC, as 3D-FRAP experiments revealed. In particular, when cells are loaded with fluorescent GJ-permeable dye and one of them is bleached, its fluorescence recovers due to the communication with neighboring cells and the resulting dye transfer (Figure 4B). Importantly, due to the presence of the superparamagnetic compound40 (Figure 5A), PEI/MNP application allows not only cell transfection, but also the simultaneous magnetization. The resulting amount of intracellular iron was measured using MPS (Figure 5B) for all applied MNP concentrations within the optimal range (2.5 pmol/cm2 miR; NP 25 complemented with 5-25 µg/mL MNP): 0.37 ± 0.079 to 0.7 ± 0.150 pg iron/cell17. As the use of magnetic separation columns demonstrated, for all these MNP concentrations, the amount of magnetically responsive cells in the total volume of transfected cells is ~70% (Figure 5C). In addition, transfected HUVECs are visible with MRI (Figure 5D) inside of in vitro agarose phantoms, mimicking mouse tissue susceptibility. Furthermore, the magnetic targeting of transfected HUVECs in dynamic conditions simulated in vitro was proven to be efficient (Figure 6). In this experimental setup, even the constant vigorous movement of culture medium did not prevent prevailing cell growth in the area near magnet application. Figure 1. Schematic Illustration of the Production of Magnetized miR-modified HUVECs and Their Analysis. 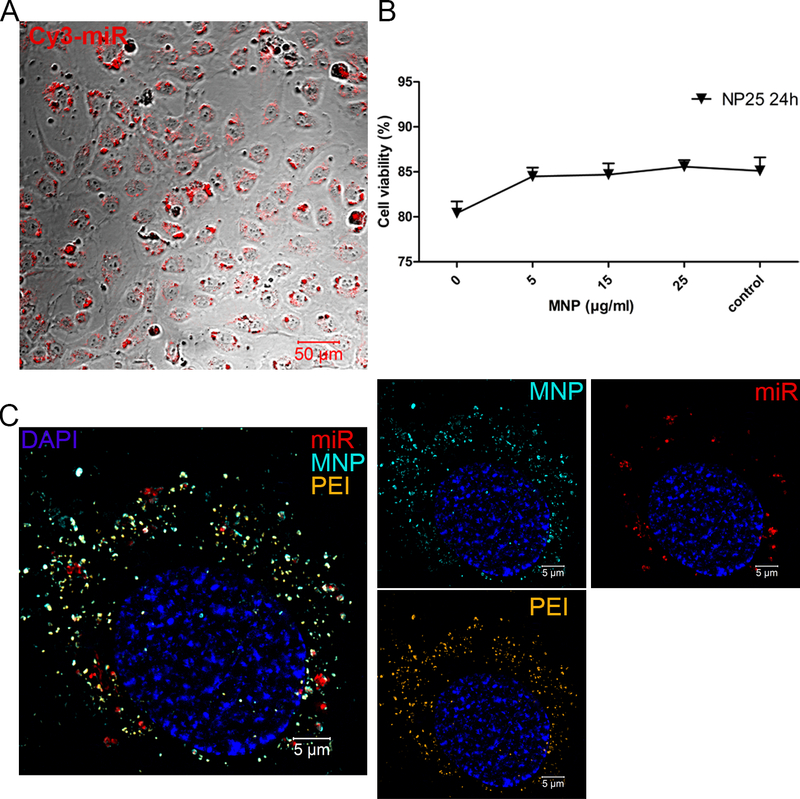 The PEI/MNP (polyethyleneimine/superparamagnetic nanoparticle-based vector) is applied to deliver microRNA (miR) to human umbilical vein endothelial cells (HUVECs). The obtained cell product is characterized by the following parameters: safety (including cell viability, functionality, and capacity for intercellular communication); transfection efficiency (i.e., miR uptake efficiency and the functionality afterwards); magnetic targeting in vitro in static and simulated dynamic conditions; magnetic resonance imaging (MRI) detection. Please click here to view a larger version of this figure. Figure 2. Characterization of Isolated HUVEC. A. Representative image of isolated and cultured HUVECs stained with endothelial CD31 marker. The nuclei are counterstained with DAPI (blue). The scale bar is 20 µm. B. Representative result of the tube formation assay performed on isolated HUVECs; the image was recorded using a laser scanning confocal microscope (differential interference contrast) 18 h after cell seeding on the basement membrane matrix. The scale bar is 100 µm. Please click here to view a larger version of this figure. 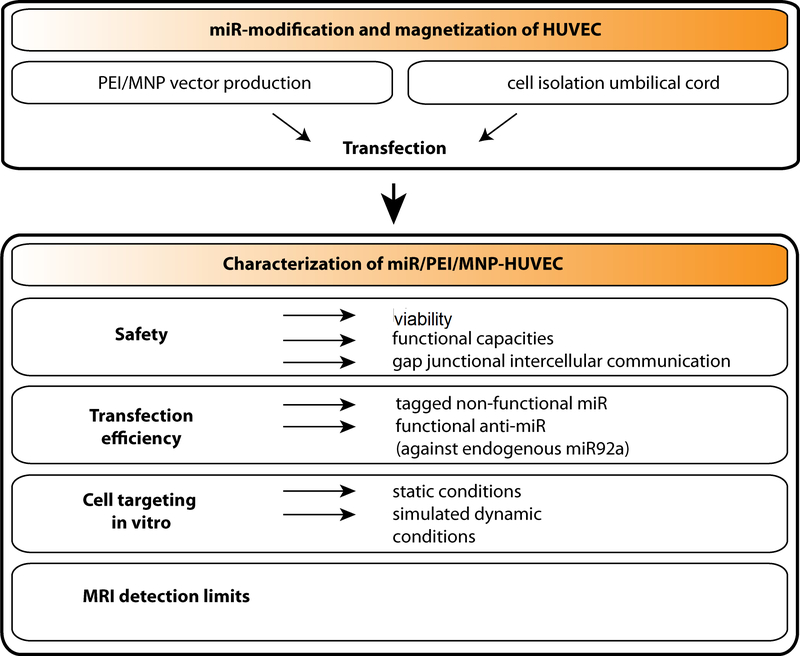 Figure 3. miR Delivery to HUVECs using PEI/MNP. A. The uptake of tagged miR (Cy3, red) 24 h post-transfection (2.5 pmol/cm2 of Cy3-tagged miR, NP 25 and MNP 25 µg/mL) and the maintenance of normal cell appearance are illustrated. Images were taken by confocal laser scanning microscopy using a 514-nm excitation laser (Cy3, red) and differential interference contrast. The scale bar is 50 µm. B. Cell viability 24 h post-transfection was assessed by flow cytometry. The plot represents the results obtained for HUVECs treated with the following complex compositions: 2.5 pmol/cm2 of Cy3-miR; NP ratio 25 complemented with 5 to 25 µg/mL of MNPs. The bars depict the ratio between the average number of viable cells and the whole cell population (n=6; error bars: SEM). C. Structured illumination microscopy (SIM) imaging of 3-color labeled miR/PEI/MNP complexes taken up by HUVECs. The cells were transfected as described above, incubated, and fixed 24 h post-treatment; the nuclei were counterstained with DAPI. Raw SIM data were recorded in z-stacks and processed; the representative images are the result of the maximum intensity projection. The following excitation lasers were applied: 405 nm (DAPI, blue), 488 nm (Atto488-PEI, orange), 565 nm (Atto565-MNP, cyan), and 633 nm (Cy5-miR, red). The scale bar is 5 µm. Please click here to view a larger version of this figure. Figure 4. The Safety of HUVECs Modification with miR/PEI/MNP. A. A tube formation assay was performed with transfected cells (2.5 pmol/cm2 of scr-miR; NP 25 and MNP 25 µg/mL) 48 h post-treatment. Images were acquired with a laser scanning confocal microscope (i.e., differential interference contrast) 18 h after cell seeding on basement membrane matrix. HUVECs transfected with miR/PEI were used as a toxicity control and untreated cells as a positive control. The scale bar is 100 µm. The plot reflects the ratio between the transfected HUVECs and the untreated cells using several parameters: tube length, number of branches, and junctions (n= 3, error bars: SEM). B. The gap junction-mediated intercellular communication of miR/PEI/MNP-modified HUVECs was evaluated 24 h post-transfection. For this purpose, cells were loaded with the GJ-permeable dye calcein (orange); fluorescence recovery after photobleaching (FRAP) was examined in 3D by scanning test cells in z-stacks. Representative images of calcein-loaded cells before the bleaching, directly after bleaching, and 15 min post-bleaching (with recovered fluorescence) are depicted. The scale bar is 20 µm. Please click here to view a larger version of this figure. Figure 5. Cell Magnetization Resulting from Transfection with PEI/MNP and its Application. A. Representative image of filtered MNPs, taken with TEM, illustrating their clustered morphology. A small size (~ 5 - 15 nm) of single iron oxide particles (resulting in superparamagnetism) is thereby confirmed. The scale bar is 100 nm. B. The intracellular loading of transfected cells was evaluated by magnetic particle spectroscopy (MPS) 24 h post-transfection. The representative panel depicts the MPS spectrum of examined samples. In particular, pure MNP suspension (50 µL) served as a reference (blue squares); the circles are the MPS spectra of two transfected cell samples (red circles: MNP 25 µg/mL; green circles: MNP 5 µg/mL), while the gray triangles show the detected background spectrum obtained by a measurement without any sample. Note the logarithmic scale of the amplitude (A). C. The amount of magnetically modified cell was quantified by the application of transfected HUVECs (2.5 pmol/cm2 miR; NP 25 complemented with 5-25 µg/mL of MNP), collected by trypsinization 24 h post-treatment, to a magnetic cell separation column. The resulting magnetically positive fraction (i.e., that remained in the column) was counted, and its percentage out of the whole amount of transfected cells is reflected on the plot for each MNP concentration (red triangles). Cell viability was subsequently examined by Trypan blue exclusion assay (gray rhombuses). The data are presented as the mean ± SEM (n= 3). D. An illustrative MRI image of transfected HUVECs (300,000 cells; 2.5 pmol/cm2 miR; NP 25 & 25 µg/mL of MNP) embedded into an agarose phantom was recorded with a 7.1 T animal MRI system. Please click here to view a larger version of this figure. Figure 6. In Vitro Magnetic Targeting of miR/PEI/MNP-HUVECs in Simulated Dynamic Conditions. HUVECs were collected 24 h post-transfection (2.5 pmol/cm2 of Cy3-miR; NP 25 & MNP 25 µg/mL) and re-seeded in fresh culture medium in the wells, with a small magnet locally attached to the side wall. In turn, this culture plate was fixed to a shaker rotating at 150 rpm. Cell attachment and growth were evaluated 12 h later by fixing cells with PFA, staining their nuclei with DAPI, and performing laser scanning confocal microscopy (excitation lasers: 405 nm, DAPI, blue; 514 nm, Cy3, orange). Representative images depict cell growth in the area with magnet application; without magnet application; and in the center of the culture well, where the flow of liquid was concentrating the cells. The scale bars are 50 µm. Please click here to view a larger version of this figure. The production of genetically engineered cells loaded with superparamagnetic nanoparticles for their further magnetically controlled guidance is presented in the current protocol. The successful application of this strategy allows for the resolution of some difficulties of cell therapy, such as low retention and poor engraftment in the injured area2,3,4, by providing a targetable cell product for transplantation. Moreover, the simultaneous introduction of properly selected genetic material could promote cell properties and could thus increase functional benefits41. The current protocol has been developed on HUVECs as a model. These cells are known to be difficult to transfect and susceptible to toxic influence18,19,20. The demonstrated level of fluorophore-labeled miR uptake over 95% after PEI/MNP transfection is typically obtained with PEI-based vectors and commonly used cationic lipid-based transfection reagents (e.g., Lipofectamine)42. In addition, the optimal NP ratio of 25 corresponds with previously published values of 20 - 40 for the NP. 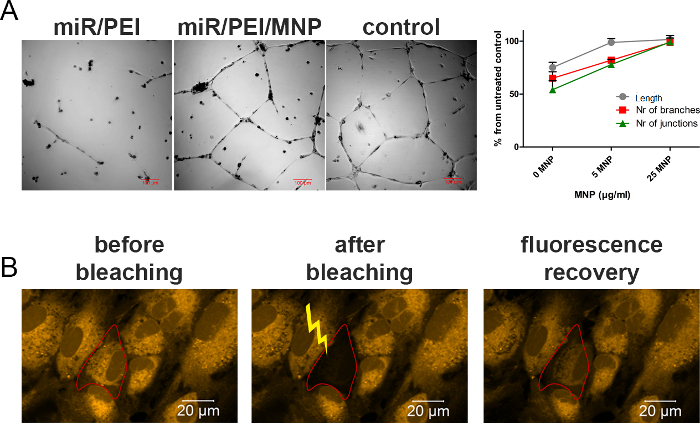 Nevertheless, the highly efficient uptake of tested fluorophore-tagged miR does not necessarily guarantee proper miR processing and function after delivery43. This point is particularly relevant in the case of PEI, with its tight electrostatic condensation of NA. Thus, the resulting functional capacity of delivered miR must also be tested. Here, a functional miR endogenously expressed in HUVEC, miR-92a31, was selected, and anti-miR against it was delivered using PEI and PEI/MNP. As a result, an almost complete knockdown of the target miR-92a proved the efficient release of the anti-miR from the transfection complexes. Importantly, in previous works, the successful application of the PEI/MNP vector was demonstrated for the delivery of plasmid DNA (pDNA) and miR to other cell types, both adherent (e.g., cos7, human mesenchymal stem cells15,16) and in suspension (e.g., bone marrow-derived CD133+ hematopoietic stem cells44). All these experiments have confirmed the known fact that the transfection efficiency and toxicity are cell type-dependent45. Thus, the selection of the optimal vector composition (i.e., miR amount, NP ratio, and amount of MNP iron) should be carried out for every particular cell type, using previously established optimal conditions as reference points. Moreover, the transient character of the achieved genetic modification should be accounted for. On the one hand, it is very suitable for certain function, such as the short-term delivery of growth factors. On the other hand, the duration of expression may not last long enough for a variety of purposes requiring long-term expression. Nevertheless, the proven safety of the PEI/MNP vector supports its possible repeated administration once the conditions are further optimized. PEI and its derivatives are commonly used due to their high efficiency compared to other non-viral vehicles and their flexibility to modification7. However, despite PEI success in vitro and in vivo, its application in clinical trials is very limited (i.e., few phase 1 and 2 trials or cancer patients)7,14 due to PEI toxicity7,13. As previous works of our group16, as well as this protocol, have demonstrated, MNPs are able to decrease PEI toxicity significantly. In particular, miR/PEI transfection has damaged the ability of HUVECs to form tubes on their matrix, thereby failing a main in vitro functional test for these cells. In contrast, tube formation performance of miR/PEI/MNP-HUVECs was comparable to untreated cells. Notably, this decrease of PEI toxicity was achieved by introducing low levels of components such as iron oxide, which are biocompatible and routinely used as a contrast reagent in human subjects40. Apart from maintaining functional properties, it is important that modified cells are capable of establishing intercellular communication, as this feature is necessary for the proper integration of cell therapeutics post-transplantation46. In addition, modified cells can be exploited as carriers for the delivery of therapeutic miR to injured tissues47. In this case, their capacity to exchange molecules with neighboring cells defines their success as a vehicle. Since PEI/MNP transfection allows GJIC in modified HUVECs, they have the potential for integration in vivo and to provide miR delivery to damaged areas. Notably, previously published works on cell magnetization for subsequent targeting have reported the cell loading of ~4 and 30 pg of iron/cell48,49,50,51. These numbers significantly exceed the values ~0.16-0.7 pg/cell, which were sufficient for the in vitro targeting of NA/PEI/MNP-HUVECs in static and simulated dynamic conditions. Such low iron amounts are beneficial in terms of safety: a commonly known mechanism of iron oxide nanoparticle-associated toxicity (i.e., the production of reactive oxygen species (ROS)) is known to be directly associated with the amount of internalized nanoparticles40. In addition, several studies have demonstrated that high intracellular levels of iron oxide nanoparticles can lead to dose-dependent cytoskeletal disorganization and damage52,53. Importantly, most reported cases of cell magnetization for targeting purposes do not include genetic cell manipulation. In contrast, the miR/PEI/MNP vector provides an opportunity to simultaneously modify cells and to add magnetic properties. However, low MNP loading might be not sufficient for magnetic targeting in a turbulent environment with blood flow. In order to come closer to the challenging in vivo situation, dynamic conditions were simulated in vitro: culture plates with magnetized miR/PEI/MNP-HUVECs in suspension were placed on the rotating shaker34. This experiment clearly cannot cover all the interactions that occur in vivo. However, it led to a better understanding of the targeting potential of PEI/MNP-modified cells. As a result, highly efficient cell targeting was demonstrated when even active shaking of the culture medium did not interfere with cell movement towards the magnet54. For this purpose, miR-modified HUVECs were loaded with at least ~ 0.16 pg of iron/cell. 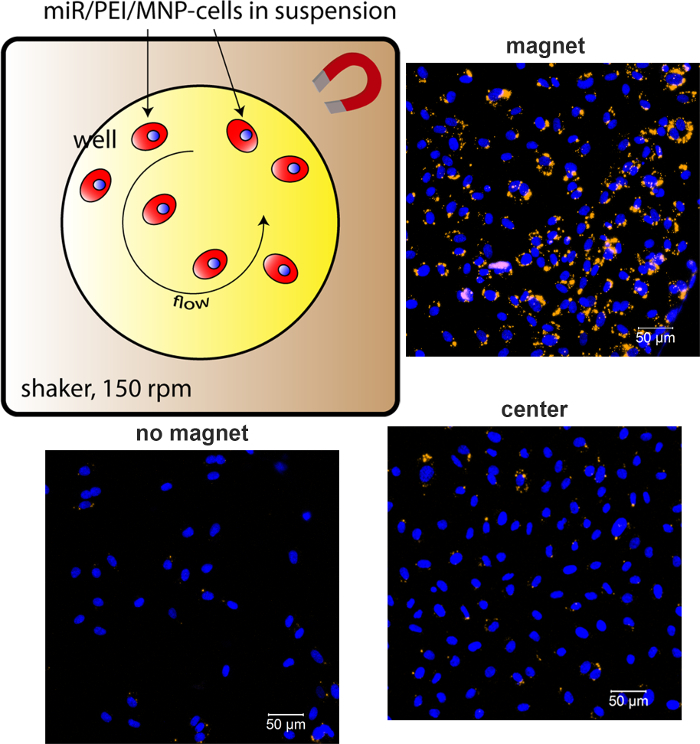 Moreover, magnetically responsive cells can be sorted. A magnet-based cell separation procedure applied to the current study has not compromised the viability of the miR/PEI/MNP-cells. Importantly, the application of a static magnetic field (i.e., targeting experiments that involved the application of a magnetic field for 12 - 24 h) did not have a damaging effect on targeted cells. Therefore, the demonstrated production of magnetized genetically modified cells provides the basis for further in vivo studies addressing the efficiency of cell retention ensured by magnetic force. Notably, the most successful in vivo studies employing the targeting of magnetized cells51,54,55 used cell retention after local administration instead of cell guidance after intravenous injection. Therefore, magnet-based retention at the site of injection appears desirable for further in vivo applications of miR/PEI/MNP-modified cells. We would like to thank G. Fulda (Electron Microscopy Center, Rostock University, Germany) for the technical support in acquiring TEM images of filtered superparamagnetic nanoparticles and in performing their X-ray analysis. The work carried out at the RTC Rostock was supported by the Federal Ministry of Education and Research Germany (FKZ 0312138A, FKZ 316159 and VIP+03VP00241) and the State Mecklenburg-Western Pomerania with EU Structural Funds (ESF/IV-WM-B34-0030/10 and ESF/IV-BM-B35-0010/12) and by the DFG (DA 1296-1), the Damp-Foundation, and the German Heart Foundation (F/01/12). Frank Wiekhorst was supported by the EU FP7 research program "Nanomag" FP7-NMP-2013-LARGE-7. Behfar, A., Crespo-Diaz, R., Terzic, A., Gersh, B. J. Cell therapy for cardiac repair-lessons from clinical trials. Nat Rev Cardiol. 11, (4), 232-246 (2014). Zeng, L., Hu, Q., et al. Bioenergetic and functional consequences of bone marrow-derived multipotent progenitor cell transplantation in hearts with postinfarction left ventricular remodeling. Circulation. 115, (14), 1866-1875 (2007). Dib, N., Khawaja, H., Varner, S., McCarthy, M., Campbell, A. Cell therapy for cardiovascular disease: a comparison of methods of delivery. J Cardiovasc Transl Res. 4, (2), 177-181 (2011). Terrovitis, J., Lautamäki, R., et al. Noninvasive Quantification and Optimization of Acute Cell Retention by In Vivo Positron Emission Tomography After Intramyocardial Cardiac-Derived Stem Cell Delivery. J Am Coll Cardiol. 54, (17), 1619-1626 (2009). Villate-Beitia, I., Puras, G., Zarate, J., Agirre, M., Ojeda, E., Pedraz, J. L. First Insights into Non-invasive Administration Routes for Non-viral Gene Therapy. Gene Therapy - Principles and Challenges. (2015). Nayerossadat, N., Maedeh, T., Ali, P. A. Viral and nonviral delivery systems for gene delivery. Adv Biomed Res. 1, 27 (2012). Yin, H., Kanasty, R. L., Eltoukhy, A. A., Vegas, A. J., Dorkin, J. R., Anderson, D. G. Non-viral vectors for gene-based therapy. Nat Rev Genet. 15, (8), 541-555 (2014). Chira, S., Jackson, C. S., et al. Progresses towards safe and efficient gene therapy vectors. Oncotarget. 6, (31), 30675-30703 (2015). Li, W., Ma, N., et al. Enhanced thoracic gene delivery by magnetic nanobead-mediated vector. J Gene Med. 10, (8), 897-909 (2008). Muthana, M., Kennerley, A. J., et al. Use of magnetic resonance targeting to direct cell therapy to target sites in vivo. Nat Commun. 6, 1-11 (2013). Zheng, B., von See, M. P., et al. Quantitative Magnetic Particle Imaging Monitors the Transplantation, Biodistribution, and Clearance of Stem Cells In Vivo. Theranostics. 6, (3), 291-301 (2016). Almstätter, I., Mykhaylyk, O., et al. Characterization of magnetic viral complexes for targeted delivery in oncology. Theranostics. 5, (7), 667-685 (2015). Juliano, R. L. The delivery of therapeutic oligonucleotides. Nucleic Acids Res. (2016). Chen, J., Guo, Z., Tian, H., Chen, X. Production and clinical development of nanoparticles for gene delivery. Mol Ther Methods Clin Dev. 3, 16023 (2016). Schade, A., Delyagina, E., et al. Innovative strategy for microRNA delivery in human mesenchymal stem cells via magnetic nanoparticles. Int J Mol Sci. 14, (6), 10710-10726 (2013). Delyagina, E., Schade, A., et al. Improved transfection in human mesenchymal stem cells: effective intracellular release of pDNA by magnetic polyplexes. Nanomedicine. 9, (7), 999-1017 (2014). Voronina, N., Lemcke, H., et al. Non-viral magnetic engineering of endothelial cells with microRNA and plasmid-DNA-An optimized targeting approach. Nanomedicine. 12, (8), 2353-2364 (2016). Hunt, M. A., Currie, M. J., Robinson, B. A., Dachs, G. U. Optimizing transfection of primary human umbilical vein endothelial cells using commercially available chemical transfection reagents. J Biomol Tech. 21, (2), 66-72 (2010). Zhang, J., Wang, Z., Lin, W., Chen, S. Gene transfection in complex media using PCBMAEE-PCBMA copolymer with both hydrolytic and zwitterionic blocks. Biomaterials. 35, (27), 7909-7918 (2014). Lim, J., Dobson, J. Improved transfection of HUVEC and MEF cells using DNA complexes with magnetic nanoparticles in an oscillating field. J Genet. 91, (2), 223-227 (2012). Moore, S., Stein, W. H. A modified ninhydrin reagent for the photometric determination of amino acids and related compounds. J Biol Chem. 211, (2), 907-913 (1954). Jones, D. L., Owen, A. G., Farrar, J. F. Simple method to enable the high resolution determination of total free amino acids in soil solutions and soil extracts. Soil Biol Biochem. 34, (12), 1893-1902 (2002). Kircheis, R., Wightman, L., et al. Polyethylenimine/DNA complexes shielded by transferrin target gene expression to tumors after systemic application. Gene Ther. 8, (1), 28-40 (2001). Green, N. M. A SPECTROPHOTOMETRIC ASSAY FOR AVIDIN AND BIOTIN BASED ON BINDING OF DYES BY AVIDIN. Biochem J. 94, 23 (1965). Haugland, R. P., You, W. W. Coupling of Antibodies with Biotin. Methods Mol Biol. 418, 13-23 (2008). Braunschweig, J., Bosch, J., Heister, K., Kuebeck, C., Meckenstock, R. U. Reevaluation of colorimetric iron determination methods commonly used in geomicrobiology. J Microbiol Methods. 89, (1), 41-48 (2012). Andrade, ÂL., Valente, M. A., Ferreira, J. M. F., Fabris, J. D. Preparation of size-controlled nanoparticles of magnetite. J Magn Magn Mater. 324, (10), 1753-1757 (2012). Barbaro, D., Di Bari, L., et al. Glucose-coated superparamagnetic iron oxide nanoparticles prepared by metal vapour synthesis are electively internalized in a pancreatic adenocarcinoma cell line expressing GLUT1 transporter. PLoS ONE. 10, (4), e0123159 (2015). Gaebel, R., Ma, N., et al. Patterning human stem cells and endothelial cells with laser printing for cardiac regeneration. Biomaterials. 32, (35), 9218-9230 (2011). Martín de Llano, J. J., Fuertes, G., Torró, I., García Vicent, C., Fayos, J. L., Lurbe, E. Birth weight and characteristics of endothelial and smooth muscle cell cultures from human umbilical cord vessels. J Transl Med. 7, 30 (2009). Bonauer, A., Carmona, G., et al. MicroRNA-92a controls angiogenesis and functional recovery of ischemic tissues in mice. Science. 324, (5935), 1710-1713 (2009). Wang, W., Li, W., et al. Polyethylenimine-mediated gene delivery into human bone marrow mesenchymal stem cells from patients. J Cell Mol Med. 15, (9), 1989-1998 (2011). Lemcke, H., Peukert, J., Voronina, N., Skorska, A., Steinhoff, G., David, R. Applying 3D-FRAP microscopy to analyse gap junction-dependent shuttling of small antisense RNAs between cardiomyocytes. J Mol Cell Cardiol. 98, 117-127 (2016). Cheng, K., Li, T. -S., Malliaras, K., Davis, D. R., Zhang, Y., Marbán, E. Magnetic targeting enhances engraftment and functional benefit of iron-labeled cardiosphere-derived cells in myocardial infarction. Circ Res. 106, (10), 1570-1581 (2010). Strober, W. Trypan Blue Exclusion Test of Cell Viability. Curr Protoc Immunol. A.3B.1-A.3B.2 (2001). Chorny, M., Alferiev, I. S., et al. Formulation and in vitro characterization of composite biodegradable magnetic nanoparticles for magnetically guided cell delivery. Pharm Res. 29, (5), 1232-1241 (2012). Poller, W., Löwa, N., et al. Magnetic Particle Spectroscopy Reveals Dynamic Changes in the Magnetic Behavior of Very Small Superparamagnetic Iron Oxide Nanoparticles During Cellular Uptake and Enables Determination of Cell-Labeling Efficacy. J Biomed Nanotechnol. 12, (2), 337-346 (2016). Lobsien, D., Dreyer, A. Y., Stroh, A., Boltze, J., Hoffmann, K. T. Imaging of VSOP Labeled Stem Cells in Agarose Phantoms with Susceptibility Weighted and T2* Weighted MR Imaging at 3T: Determination of the Detection Limit. PLoS ONE. 8, (5), 1-10 (2013). Hernando, D., Kühn, J. -P., et al. R2* estimation using "in-phase" echoes in the presence of fat: the effects of complex spectrum of fat. J Magn Reson Imaging. 37, (3), 717-726 (2013). Soenen, S. J., Rivera-Gil, P., Montenegro, J. -M., Parak, W. J., De Smedt, S. C., Braeckmans, K. Cellular toxicity of inorganic nanoparticles: Common aspects and guidelines for improved nanotoxicity evaluation. Nano Today. 6, (5), 446-465 (2011). Robert, D., Kirkton, N. B. Genetic Engineering and Stem Cells: Combinatorial Approaches for Cardiac Cell Therapy. IEEE Eng Med Biol Mag. 27, (3), 85 (2008). Chen, Y., Wang, W., et al. Development of an MRI-visible nonviral vector for siRNA delivery targeting gastric cancer. Int J Nanomedicine. 7, 359-368 (2012). Diener, Y., Jurk, M., et al. RNA-based, transient modulation of gene expression in human haematopoietic stem and progenitor cells. Sci Rep. 5, 17184 (2015). Müller, P., Voronina, N., et al. Magnet-Bead Based MicroRNA Delivery System to Modify CD133+ Stem Cells. Stem Cells Int. 2016, 1-16 (2016). Yang, H., Vonk, L. A., et al. Cell type and transfection reagent-dependent effects on viability, cell content, cell cycle and inflammation of RNAi in human primary mesenchymal cells. Eur J Pharm Sci. 53, 35-44 (2014). Chen, C. -H., Sereti, K. -I., Wu, B. M., Ardehali, R. Translational aspects of cardiac cell therapy. J Cell Mol Med. 19, (8), 1757-1772 (2015). Alaiti, M. A., Ishikawa, M., et al. Up-regulation of miR-210 by vascular endothelial growth factor in ex vivo expanded CD34+ cells enhances cell-mediated angiogenesis. J Cell Mol Med. 16, (10), 2413-2421 (2012). Landázuri, N., Tong, S., et al. Magnetic targeting of human mesenchymal stem cells with internalized superparamagnetic iron oxide nanoparticles. Small. 9, (23), 4017-4026 (2013). Carenza, E., Barceló, V., et al. In vitro angiogenic performance and in vivo brain targeting of magnetized endothelial progenitor cells for neurorepair therapies. Nanomedicine. 10, (1), 225-234 (2014). Kyrtatos, P. G., Lehtolainen, P., et al. Magnetic Tagging Increases Delivery of Circulating Progenitors in Vascular Injury. JACC Cardiovasc Interv. 2, (8), 794-802 (2009). Huang, Z., Shen, Y., et al. Magnetic targeting enhances retrograde cell retention in a rat model of myocardial infarction. Stem Cell Res Ther. 4, (6), 149 (2013). Wu, X., Tan, Y., Mao, H., Zhang, M. Toxic effects of iron oxide nanoparticles on human umbilical vein endothelial cells. Int J Nanomedicine. 5, 385-399 (2010). Soenen, S. J. H., Nuytten, N., De Meyer, S. F., De Smedt, S. C., De Cuyper, M. High Intracellular Iron Oxide Nanoparticle Concentrations Affect Cellular Cytoskeleton and Focal Adhesion Kinase-Mediated Signaling. Small. 6, (7), 832-842 (2010). Cheng, K., Malliaras, K., et al. Magnetic enhancement of cell retention, engraftment, and functional benefit after intracoronary delivery of cardiac-derived stem cells in a rat model of ischemia/reperfusion. Cell Transplant. 21, (6), 1121-1135 (2012). Vandergriff, A. C., Hensley, T. M., et al. Magnetic targeting of cardiosphere-derived stem cells with ferumoxytol nanoparticles for treating rats with myocardial infarction. Biomaterials. 35, (30), 8528-8539 (2014).